Reading and share top 17 famous quotes and sayings about Attolia by famous authors and people. Browse top 17 famous quotes and sayings about Attolia by most favorite authors. 1. 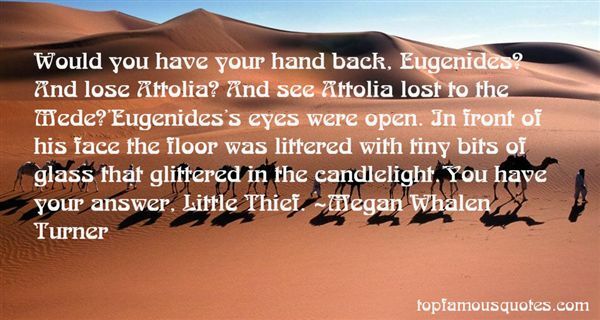 "Would you have your hand back, Eugenides? And lose Attolia? And see Attolia lost to the Mede? 'Eugenides's eyes were open. In front of his face the floor was littered with tiny bits of glass that glittered in the candlelight. 'You have your answer, Little Thief." 2. "You will make the boy Thief king?" he [Nahuseresh] said. "When you could have had me? "Attolia allowed a slight smile. "A fine revenge for the loss of a hand," said the Mede, close to snarling. "I will have my sovereignty," said Attolia thinly. "Oh, yes, a fine one-handed figurehead he will make," spat Nahuseresh. Then he remembered Attolia's flattery earlier that morning. "Or do I insult your lover?" he asked. "Not a lover," said Attolia. "Merely my choice for king." 3. "I know," Attolia soothed him. "I did not say that I am afraid. He is, though, I think. Afraid of his own desire for power. He is not unused to wielding power, but it has always been in secret. I could, of course, command him to be king. He will give me anything I ask. ""That would only confirm your sovereignty, not his," Relius objected. "So," agreed the queen.Relius considered he, sitting beside him. She didn't seem unduly concerned. "I am confident, My Queen, that if you have met your match, so has he." 4. "If Attolia could look like a queen, Eugenides was like a god revealed, transformed into something wholly unfamiliar, surrounded by the cloth-of-gold bedcover like a deity on an altar, passionless and calculating." 5. "We would have died without the additional men," he admitted matter-of-factly. "But we would have taken the entire Mede army with us. Poets would have written about us, and songs would have been sung about us-""For all the good that would have done your dead bodies," Eugenides cynically interrupted. "Well, I wasn't looking forward to it," said Sounis caustically. "But over our dead bodies the Medes would never have been accepted by the people of Sounis. Much more likely that they would have allied with Attolia." He looked at Eugenides, who was still eyeing him in surprise. "I didn't expect to die," he said. "I knew you would send help.""Why? "It was Sounis's turn to be surprised. He said, "You told me you needed me to be Sounis. I am. I needed my king to send me help. You did. There had to be reinforcements at Oneia, so they were there." To him it was obvious.Eugenides swallowed. "I see." 6. "If I couldn't be Eddis, I would be Attolia. If they needed to see my uncle in me, then I would show him to them. And I would take Attolia's advice because if I identified my enemy and destroyed him, Sounis would be safe." 7. "That one,"-he nodded toward the closed door-" will rule more than just Attolia before he is done. He is an Annux, a king of kings." 8. "Relius looked away. "He said that you...cried," he said softly. "But not that he cried as well," said the queen, amused at the memory. "We were very lachrymose... would you like to hear more romance of the evening? He told me the Guard should be reduced by half, and I threw an ink jar at his head. ""Is that when he cried? ""He ducked," said Attolia dryly. "I had not pictured you for a fishwife. ""Lo, the transforming power of love." 9. "The pain was as unexpected as a thunderclap in a clear sky. 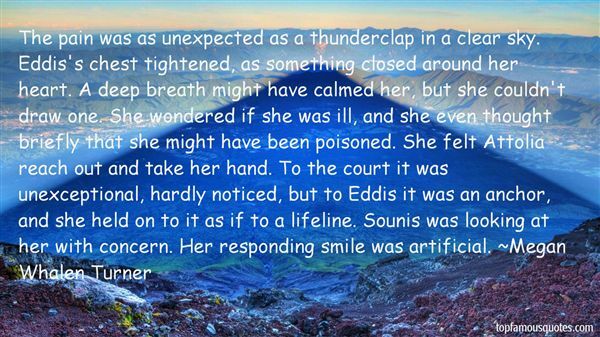 Eddis's chest tightened, as something closed around her heart. A deep breath might have calmed her, but she couldn't draw one. She wondered if she was ill, and she even thought briefly that she might have been poisoned. She felt Attolia reach out and take her hand. To the court it was unexceptional, hardly noticed, but to Eddis it was an anchor, and she held on to it as if to a lifeline. Sounis was looking at her with concern. Her responding smile was artificial." 10. "Because you do not believe? ""Oh, no," said Attolia bitterly. "Because I believe and do not choose to worship." 11. "-You know-- Eddis hesitated, not sure how far to push the Attolian Queen. -Go on. Attolia inclined her head.-I was going to say that you look like a polecat when you smile like that. -Do I? Attolia still smiled. -You look a little vulpine yourself.The two queens sat for a moment in happy agreement." 12. 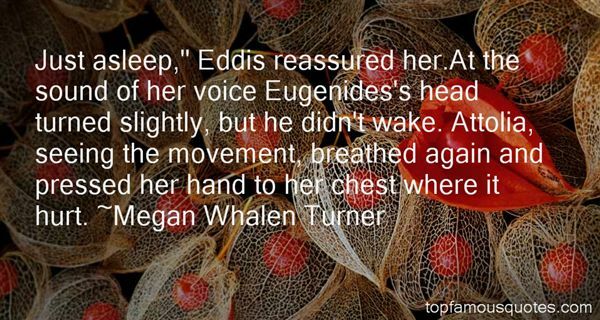 "Just asleep," Eddis reassured her.At the sound of her voice Eugenides's head turned slightly, but he didn't wake. Attolia, seeing the movement, breathed again and pressed her hand to her chest where it hurt." 13. "Attolia had brushed Eugenides's cheek almost shyly before sending him with a wave back to his own couch." 14. "Darker thoughts crowded in during the deepest hours of the night when he woke listening to the secret mystifying sounds of the sleeping palace. Many nights, the king was there. Pleasant, irrelevant, and distracting, he eased Relius past nightmares and self-recrimination. Some nights he said nothing at all, just comforted with his presence. Other nights he related the events of his day, spewing out his insights and analyses of the Attolian court in a devastatingly funny critique." 15. "Eddis looked at her minister, curious. "Your head?" she asked.Attolia explained. "He had to be forcibly dissuaded from strangling his son. ""So have we all from time to time," Eddis said seriously." 16. "Treachery," said the Mede. "Diplomacy," said Attolia, "in my own name." 17. "Sophos, you sleep with a knife under your pillow? I'm hurt. ""I'm sorry," said Sounis, afraid that he had made contact with his wild swing. "I was joking. Wake up the rest of the way, would you? ""Gen, it's the middle of the night. ""I know," said the king of Attolia.Sounis tried to rub the sleep out of his eyes. He was sitting up in his bed. The sky was still entirely dark, and he couldn't have been asleep for long. He suspected that he had just dropped off. The bare knife was still in his hand, he realized, and he rooted under his pillow for the sheath. "Don't you trust my palace security? ""Yes, of course," Sounis said, trying to think of some other reason besides mistrust to sleep with a knife. He heard Eugenides laugh. "My queen and I sleep with a matched set under our pillows, as well as handguns in pockets on the bedposts. Don't be embarrassed." It is not because the truth is too difficult to see that we make mistakes... we make mistakes because the easiest and most comfortable course for us is to seek insight where it accords with our emotions - especially selfish ones."